Sasha Ambrose of Gympie, Queensland has earned her 15 minutes of fame, plus a bit more. 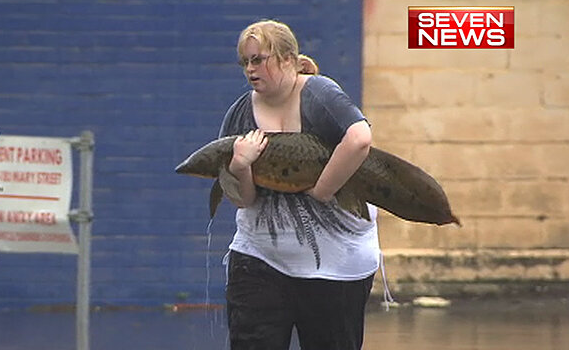 Sasha rescued an Australian lungfish from flood waters that had carried it into a hotel parking lot. According to Sasha, the fish was exhausted from fighting the flood waters and had an cut on top of its head. So, she picked it up and carried it to a better location. Before releasing the fish, Sasha remembered lessons learned from the television show, River Monsters. So she held the fish out of water a bit, presumably so it could catch its breathe, then released it. The Australian lungfish is one of six species (three genera) of lungfish left in the world (the others occur in South America and Africa). It is the only one, however, that has functioning gills. The fish was in no danger of drowning if Sasha had not held it out of the water. It’s fortunate for the lungfish that Sasha learned something harmless from the television. She could have been watching a bass fishing show and learned that she needed to puncture the swim bladder (= lung) before releasing the fish. Anyway, it is likely that Sasha’s actions saved the fish. There are fewer than 10,000 remaining Australian lungfish Neoceratodus forsteri. 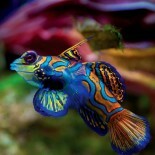 The species is listed as Vulnerable in Australia and is protected from fishing. Declining abundance of Australian lungfish is associated with dams, which have modified its habitat and have, in particular, reduced available breeding habitat. This entry was posted on March 5, 2013 by denstormer in Conservation and tagged Australia, endangered species.